After writing a few lines of the program it is advisable the save your work. As explained early in the manual it is good to assign a USB drive for this purpose. Press the “File” menu and choose “Save As …”. 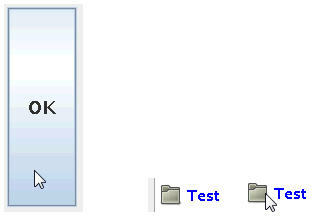 A Screen with file structure and files already present on the Hard drive (Flashcard) appears and the USB drive is already shown as a Directory. The controller recognizes the USB drive automatically. In this case the USB drive has the name “”NANO_1G_F32” which was a name I give it while it was sitting on my office computer, but this can be any legal computer file name. Sometimes a USB drive has a default name when it is purchased and sometimes it is just without a name so you might see other names or even “unknown”. This is not important as long you know it is the USB drive you inserted to the robot controller. Press on the name “NANO_1G_F32” to go into that directory i.e. go to the drive. If the USB drive is empty there are no directories on the USB drive and you can use the scissor symbol to create a directory. If there is already directories from where it was in your office computer then will be shown on the Screen and you can chose to go to the sub directory. Here we will create a sub directory. The controller suggests “new dir” as a name, but better to choose something else that says something about the content of the directory. Press behind the new dir name and use the << button to delete the “new dir” name. Use the onscreen keyboard to create a new name e.g. Test in this case. Press “OK” when finish the name. A new directory called “Test” appears. Press on the “Test” directory to go into it. 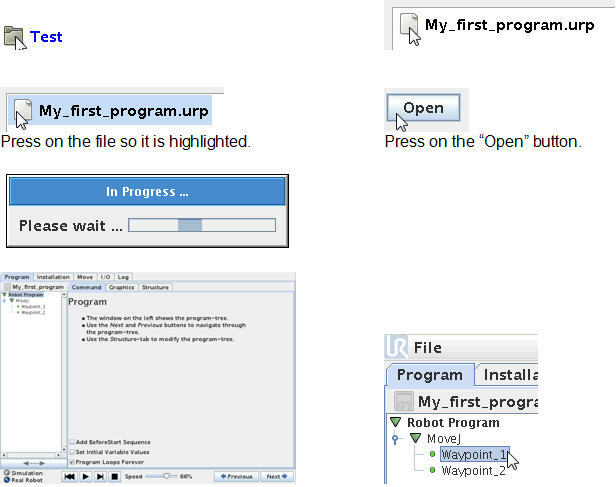 Press the on Screen keyboard symbol to type in your desired file name for your program. In this case we call it My_first_program. If you have connected a keyboard along with the mouse, then you can use the keyboard to key in which is much more convenient. Press “OK” when finish typing. Notice after pressing “OK” the file name is listed below on the Screen. Press “Save” to save the file and a popup messages appear to confirm the save of file. After the controller finish the save it returns to the Program tree we were working on and we can continue programming which will be explained in the next chapters. Load a program from USB drive. To load back a program that we previously have saved on the USB drive press the “File” menu – choose “Load”. Press on the name for the USB drive (in my case NANO_1G_F32). If you choose to create sub directories then go all the way down to your file by pressing the sub directories until you see your file you wish to load. Press on the file so it is highlighted. Press on the “Open” button. 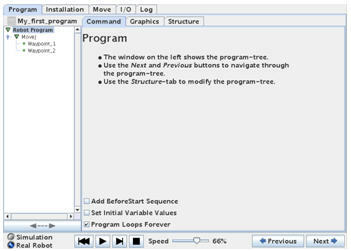 You will see your program reload into the Program tree block and you can continue to edit the program or simply use the program if is a finish ready made program. I wrote a .script file on my remote pc in order to test, whether the functions I have used do what I would like them to do. I’ve now transfered this .script file to the UR5e-Robot by USB and would like to execute this file on my robot. However, it does not work. Is it right to execute a .script file over there? Or is there some sort of guide available here? Is there a way to delete all programs in the UR teach pendent ? I cant delete a folder as its saying i need to delete the contents inside it first. But there are lot of files in a folder including all the urp,txt and script files.So deleting each file one by one is not a good option.I checked the magic files but i coudnt find anything. One way is to keep the files on a USB thumb drive and then when need to organize files then move the USB drive to a PC to do the cleaning. Today I tried to transfer file from the robot to my USB-stick. Although the robot recognize my USB-stick and I can even browse the folders and files in it, I cannot save the programm files to it. It keeps saying that “File could not be written to USB-stick, please check if it is attached” something like that. Using magic file didn’t help either. So I finally discovered the problem: as it turns out my USB-stick was using NTFS. When I converted it to FAT32, everything worked just fine. I just want to tell you this issue and someone who might have been experiencing the same problem. Hope that could help you guys! I am running the URSim3.3.1 with the virtual machine. I don’t see any FTP setting running on the virtual machine. Is this normal? How should I send an URP file to the robot remotely ? Maybe consider to use “Bridge network setting” and set the IP address on the virtual machine in /etc/network/interfaces (the file is interfaces). FTP can be used to transfer files to the robot. My question was more focused on the FTP: Should it be already active an FTP server on the Simulator (or on the robot) ? I have already set the bridged adapter on the VM but I wasn’t able to send any file to the simulator. 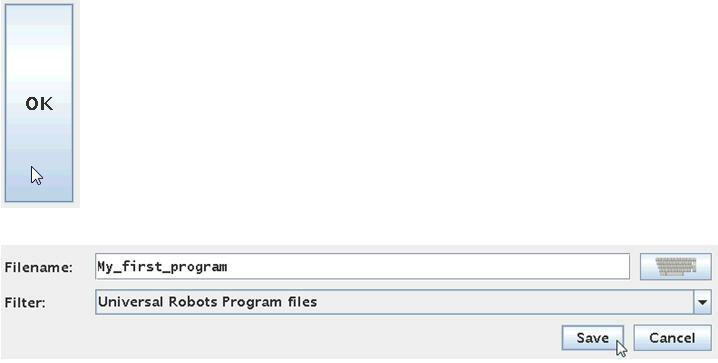 FTP is active on the robot and its possible to transfer files between the robot and a PC with a FTP program. You might need a password and maybe it is like as shown on UR webpage at this link below. If the password has been changed then you might need to contact your robot provieder. I’m trying to program our UR10 on my computer. I installed Linux on my pc and copied the files from the robot on a USB stick. However if I open this program on my computer all my variables are lost. If I make them again and then open the program on the robot from the usb stick I have the same problem. Any ideas how to solve this problem? Are you using the UR simulator ? and did you copy all the files for the program including the default instaltion and variables files ? Thanks for your answer. Yes, I’m using the UR simulator. When I connect the usb stick to the controller of the robot it start copying files. However if I open the files on my computer I can’t find a .variables file. Only programs and installations. Then when a Polyscope GUI robot program is made there will be created 5 files when the program is saved – for example if the name of the program is “test” then these files will be created. If there is made modifications to the program then some old versions of the program will also be in the directory. What is the default login and password that has to be provided? Your supplier should be able to know. The browser gets stuck trying to connect during a while, finally the browser gives up. I do not know if a default user and password is needed. Try to activate SSH protocol. Yes use port 22.